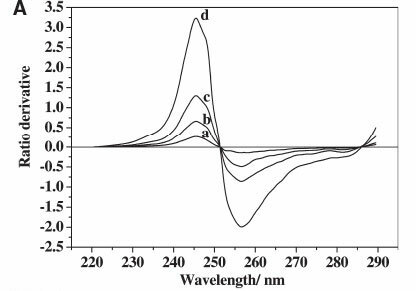 A simplified method based on ratio derivative ultraviolet spectrometry for simultaneous determination of bisphenol A (BPA) and bisphenol S (BPS) in environmental water is presented. The method provides a direct analysis of the samples without tedious sample preparation. In this method, the overlapping spectra of BPA and BPS were well resolved using the first derivative (Δλ = 1 nm) of the ratio of their absorption spectra. 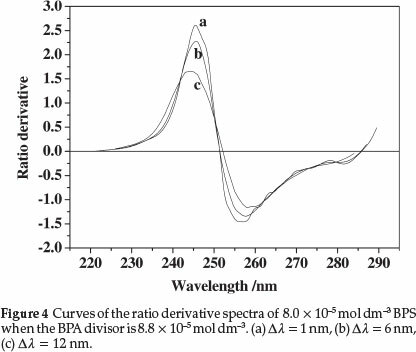 Measurements of absorbance were performed at wavelengths of 229.5 nm and 245.5 nm for BPA and BPS, respectively, using the ratio derivative spectrum method. Beer's law was followed in the concentration range of 8.8 X 10-7-2.2 X 10-4 mol dm-3 for BPA and 1.4 X 10-6-1.0 X 10-4 mol dm-3 for BPS. The limits of detection were 3.5 X -7 mol dm-3 for BPA and 4.4 X 10 7 mol dm 3 for BPS. Their 5:1 to 1:5 mixtures were resolved with recoveries between 90.5 % and 100.9 % for BPA and between 93.8 % and 101.1 % for BPS. The method was satisfactorily applied to the simultaneous determination of BPA and BPS in environmental water samples. Bisphenol A (BPA, 2,2-bis(4-hydroxy-phenyl)propane) is an important chemical raw material for the production of polycarbonate, epoxy resins, unsaturated polyester resins, and polyacrylate and polysulphone resins.1 It can also be used in the production of some fine chemical products, such as thermal stabilizers, antioxidants, plasticizers, flame retardants, pesticides, paints, and so on. Due to endocrine disruptors (EDs) activity, environmental pollution produced by BPA has raised wide concern.2,3 Bisphenol S (BPS, 4,4'- sulphony diphenol) is similar to BPA in many properties and uses, especially with respect to aggregation. BPS can also replace BPA in improving the mechanical properties and thermal stability of polymeric prod-ucts.4 The applications and development of BPS have gradually catched up with or even surpassed those of BPA.5 Experiments have proven that BPS also acts as a kind of EDs6,7 and presents a potential threat to human health. Therefore, establishing an efficient method for the simultaneous determination of BPA and BPS concentrations is necessary. Until now, simultaneous determination of BPA and BPS concentrations has been mainly accomplished using solid-phase microextraction-gas chromatography-mass spectrometric (GC-MS) method8 and pyrolysis-GC-MS9. Although liquid chromatography10 and GC-MS are highly accurate and widely used in estrogenic phenol quantification, these techniques involve either complex sample preparation or toxic organic solvents. In addition to the need for trained technicians, these techniques are also time-consuming and expensive, making their popular applications quite challenging. Therefore, an inexpensive, fast, and sensitive method is necessary to monitor the BPA and BPS level in environmental samples. In this paper, we have determined that the ratio derivative spectrum method can also be applied for simultaneous determination of BPA and BPS in water solution. Based on the spectrum properties of BPA and BPS, a new analysis method for the simultaneous determination of BPA and BPS concentration was established, and the measurement conditions are optimized in this paper. The method is simple and less expensive compared to the above-mentioned techniques, and at the same time it offers good accuracy and precision. The study instruments used in this study included the following: a UV1102 spectrophotometer with 1.0 cm quartz cells (Shanghai Techcomp Instrument Ltd., Shanghai); and PHS-P Acidimeter (Shanghai Precision & Scientific Instrument Co., Ltd., Shanghai). A4.4X10-4 mol dm-3 BPA stock solution was prepared by dissolving 25.0 mg commercial BPA (obtained from Shanghai Biotechnology Co., Ltd.) in a 250.0 mL volumetric flask with 5.0 mL ethanol, and the volume was filled up to the scale with water. A 4.0 X 10-4 mol dm-3 BPS stock solution was prepared by dissolving 25.0 mg commercial BPS (purchased from Beijing Hengye Zhongyuan Chemical Co., Ltd.) in a 250.0 mL volumetric flask with 5.0 mL ethanol, and the volume was filled up to the scale with water. The stock solutions were kept at approximately 4 °C in brown bottles. Working standard solutions were made daily by appropriate dilution of the stock solutions as required. Phosphate buffer solution (PBS) was prepared by 0.1 mol dm-3 phosphate (NaH2PO4, purchased from Guanghua Technology Co., Ltd., Shanghai Chemical Reagents branch), adjusted to the desired pH value with 0.2 mol dm-3 sodium hydroxide or 0.2 mol dm-3 hydrochloric acid. All the other reagents were of analytical grade, and doubledistilled water was used in the experiment. The required amount of working standard solutions was pipetted into 10.0 mL volumetric flasks. Then, 5.0 mL of pH 6.0 PBS was added to each of the volumetric flasks and then diluted to scale with water. The absorption spectra were recorded against a reagent blank (similar to the samples to be determined without the compounds). where Amλ = absorbance of the mixture at λ; = molar absorptivity of BPA at λ; = molar absorptivity of BPS at λ; and Ca and Cs = concentration of BPA and BPS, respectively. Equation (3) indicates that the derivative of the ratio spectrum of the mixture only depends on the value of Cs and independent of the value of CA in the mixture. Equation (4) shows that the derivative of the ratio spectrum of the mixture only depends on the value of CA and is independent of the value of CS in the mixture. 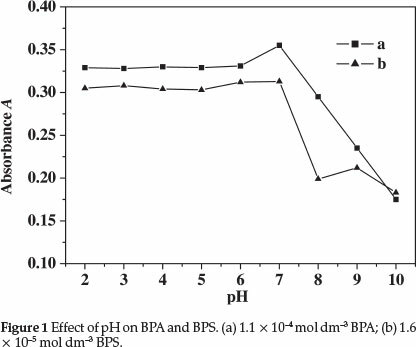 The influence of pH on the absorbance of BPS and BPA was studied, and the result is shown in Fig. 1. To establish a suitable pH, a range of pH values between 2.0 and 10.0 was examined. Very good stability was observed between pH values of 2.0 and 7.0, and the BPS and BPA absorbance value was relatively high. Therefore, the pH value of 6.0 was considered as the optimum, and the proposed method was developed at this pH value. Samples were prepared with 5.0 mL PBS at pH 6.0. 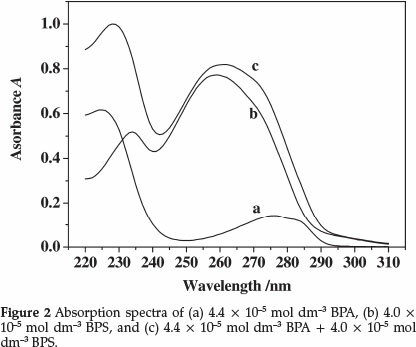 The ultraviolet (UV)-absorption spectra of BPS and BPA in the 220-310 nm wavelength range are shown in Fig. 2. 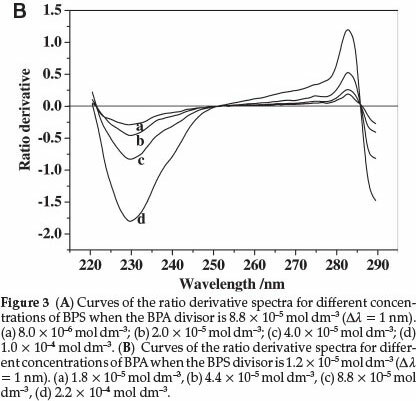 The BPA and BPS maximum absorption wavelengths were 278 nm and 258 nm, respectively, but the absorption spectrum of BPA was covered by the BPS spectrum, and the overlap of both absorption spectra rendered impossible their simultaneous determination in the mixture using conventional spectrophotometry. If they are measured individually, separation must be done first, which would obviously increase the workload of the determination and would inevitably increase the error.19 The derivative of the ratio spectra can be employed to obviate this problem. This method resolves the binary mixture of BPA and BPS with satisfactory results. To optimize the simultaneous determination of the two compounds using this technique, testing the influence of the variables, such as determination wavelength, divisor standard concentration, and Δλ is necessary.20 All these variables were studied. For the determination of BPS, BPS solution spectra at different concentrations were obtained, and the spectrum of a standard BPA solution was used to obtain the ratio spectra. The amplitudes of the BPS solution were divided, wavelength by wavelength from 220 nm to 290 nm, by the corresponding amplitudes of the standard BPA solution. The 'ratio spectra' were differentiated with respect to wavelength interval Δλ=1 nm, which gave a peak at 245.5 nm, as shown in Fig. 3A. Similarly, the ratio derivative spectra of BPA were obtained, as shown in Fig. 3B. The value at 229.5 nm was higher than that at 282.5 nm, and the difference of the absolute absorbance among BPA, BPS, and their mixture after 280 nm was too small to determine accurately (as shown in Fig. 2). Therefore, the 229.5 nm wavelength was chosen as the determination wavelength for BPA. The other main parameter for optimization in derivative spectrophotometry is the wavelength increment (Δλ) over which the derivative is obtained. This parameter needs to be optimized to yield an easily resolved large peak, i.e. good selectivity and sensitivity of the resulting ratio derivative spectra.21 Three Δλ values for the ratio derivative spectra of BPS were tested, as shown in Fig. 4, which shows that when the value of Δλ increases, the spectral intensity signal weakens, and the sensitivity of determination reduces. At the same time, the ratio derivative spectra of BPA also exhibits the same change in different wavelength intervals as that of BPS. Therefore, the derivative wavelength interval Δλ = 1 nm was selected as optimum in the proposed method. According to Eqs. (3) and (4), the ratio derivative signal is inversely proportional to the concentration of the standard solution as a divisor. The lower the divisor concentrations are, the higher are the analytical signals, which help improve the sensitivity of determination.12,22 However, the accuracy and stability of absorbance in the divisor must be considered. When the concentration of the divisor is very low, the relative error of absorbance measurement increases. 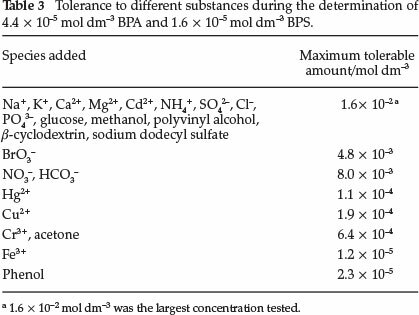 From Table 1, the standard solutions of 1.10 x 10-4 mol dm-3 BPA and 0.80 x 10-5 mol dm-3 BPS were selected as the divisor solution for all subsequent measurements. The standard values of the absorbance of each divisor solution were A0245 = 0.098, A0246 = 0.085, A0229 = 0.095, and A°230= 0.099. The calibration graphs for BPA and BPS were developed by plotting the values of the derivative of the ratio spectra of BPA/BPS and BPS/BPA (with variable BPA and BPS concentrations) at the above working wavelengths against the concentrations of standard BPS and BPA solutions. The regression equations were calculated as described in the previous section, and the parameters for linearity are listed in Table 2. The influence of some species on the UV spectrophotometric system under the presence of 4.4 x 10-5 mol dm-3 BPA and 1.6 x 10-5 mol dm-3 BPS was investigated. Some ions that commonly exist in water and organic substances, which could be used in industrial production, were chosen for the selectivity test. When the effect of each foreign species on the peak height was less than 5.0 %, the species was considered not to interfere in the PBA and BPS determination. The results obtained are summarized in Table 3. The more than 1.6 x 10-2 mol dm-3 of glucose, methanol, polyvinyl alcohol,b-cyclodextrin, and sodium dodecyl sulfate did not present any interference. No interference was also found when4.8 x 10-3moldm-3ofBr03-,8.0 x 10-3moldm-3ofN03-and HC03-, 1.1 x 10-4 mol dm-3 of Hg2*, 1.9 x 10-4 mol dm-3 of Cu2+, 6.4 x 10-4 mol dm-3 of Cr3+ and acetone, 1.2 x 10-5 mol dm-3 of Fe3+,and2.3 x 10-5moldm-3ofphenolcoexistedinthesolution. The accuracy of the proposed method was verified by recovery studies within the range of linearity for BPA and BPS. Some binary BPA and BPS mixtures were made from stock solutions in the ratio from 5:1 to 1:5 and were resolved by the proposed method. Table 4 shows the results of the determination of the different mixtures. The recoveries were between 90.5 % and 100.9 % for BPA and between 93.8 % and 101.1 % for BPS in the wavelengths studied. The results proved that the ratio derivative method is effective for simultaneous determination of BPA and BPS. The proposed method was used to analyze the BPA and BPS concentration in natural water from a river and treated wastewater from a sewage treatment factory in Changzhou, respectively. No special sample pretreatment was performed except that the water samples were filtered, as proposed by Kochana et al.24 Then, a portion of the prepared sample was diluted directly with distilled water or supplemented with different amounts of BPA and BPS. Based on the above procedure, each experiment was determinated in parallel three times, and the results were averaged. The analysis results obtained for the different types of water are presented in Table 5. The experimental results for 93.2 % of BPA recovery with 1.18 % error - 102.9 % of BPS recovery with 0.47 % error indicated that no serious interference was found in the samples. Thus, the proposed method can be well applied to real samples. A ratio spectra derivative method for simultaneous determination of BPA and BPS has been proposed and established. This method is simple, economical, rapid, and precise and does not require any separation of BPA and BPS. The regression equations are DBPA = -1.28 x 104c - 0.0128 for BPA between 8.8 x 10-7 mol dm-3 and 2.2 x 10-4 mol dm-3 and DBPS = 2.61 x 104c + 0.0166 for BPS between 1.4 x 10-6 mol dm-3 and 1.0 x 10-4 mol dm-3. The method has been successfully applied to determine BPA and BPS in laboratory mixtures and in real water samples. This project was supported by the Universities Natural Sciences Research Project of Jiangsu Province (12KJD610001), Science and Technology Program of Changzhou (CJ20120020) and Natural Science Research Project of Changzhou Institute of Technology (YN1009) for financial support.